Used model railways & collections always wanted. Peters Spares Model Railways Ltd. Carbon Brush. Exercise of the right to withdraw or cancel. How it started; I have been interested in model trains since I was a child. This item also replaces part X8029 (eg for the Class 86). Used model railways & collections always wanted. Peters Spares Model Railways Ltd. How it started; I have been interested in model trains since I was a child. TRIANG KING CLASS COMPLETE DECORATED TENDER WITH BODY, SIX WHEELED ROLLING CHASSIS, BUFFERS, DRAWBAR AND COUPLING INCLUDED. LOOKS TO A PART REPAINT. NICE RUNNER. VGC. SEE PICS. 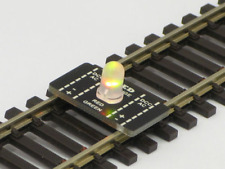 The polarity (or train direction) of the rails is shown on the tester. -Small enough to check point frogs. This is a special version of my double iPhone designed specifically for the Bachmann class 37 where the bigger double iPhone speaker didn’t quite fit but will fit other models too. These speakers are small yet produce a big sound, making them ideal for DCC sound. SPRUNG BUFFERS. WILL SUIT 9F OR 5MT. NO COUPLING. SPLIT FROM BACHMANN RELEASE 32-507. OF COURSE ONLY THE TENDER IS FOR SALE. 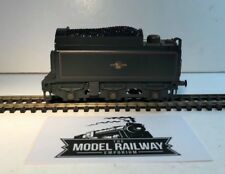 REMOVED FROM THE BACHMANN BR STANDARD CLASS 5 LOCOMOTIVE 73050. HORNBY ACHILLES 3046 CLASS GWR GREEN RENUMBERED TO 3045 AND RENAMED TO HIRONDELLE BODYSHELL C/W FIXING SCREW. NR XCLNT . UNDAMAGED. SEE PICS. (WORKING MOTORISED CHASSIS ALSO OFFERED AS ITEM HRT219) FOR MORE BARGAINS PLEASE CHECK OUT MY SHOP AT TONYSSTOREONLINE. OVERSEAS BUYERS ARE WELCOME BUT PLEASE CHECK OUT THE PAYMENT AND POSTAL ARRANGEMENTS. THANKS FOR READING THE SMALL PRINT BELOW - IT'S THERE FOR YOUR PROTECTION - AND MINE, AND TO AVOID MISUNDERSTANDINGS. WHY NOT CHECK OUT MY OTHER ITEMS AND ALSO MY FEEDBACK FOR YOUR REASSURANCE. HAPPY BUYING. Triang OO/HO R132 Transcontinental Vista Car - NEW LOWER START! Triang Railways OO/HO R132 Transcontinental Vista Car. However the wheels are bright steel (may be a modification?). and the car runs very well indeed. 1 sheet 140mm x 200mm. An appropriate NEM pocket is chosen suitable for the model and is fitted onto the square pin. Used model railways & collections always wanted. How it started; I have been interested in model trains since I was a child. It has the front buffers ,whistles - all the handrails and the bright steel reverser. 8073 8F numbering poor one side good all round example. This body fits the ringfield motor version. Presumablly Wren as well. ​OFFERED IS A 30cms LENGTH OF UNIVERSAL LOCOMOTIVE HANDRAIL WIRE COMPLETE WITH 13 KNOBS. PART S9818 CUT AND CUSTOMISE TO FIT MOST LOCOMOTIVES INCLUDING NON HORNBY APPLICATIONS. FREEPOST TO UK. OVERSEAS AT AROUND COST. FOR MORE BARGAINS PLEASE CHECK OUT MY SHOP AT TONYSSTOREONLINE. OVERSEAS BUYERS ARE WELCOME BUT PLEASE CHECK OUT THE PAYMENT AND POSTAL ARRANGEMENTS. THANKS FOR READING THE SMALL PRINT BELOW - IT'S THERE FOR YOUR PROTECTION - AND MINE, AND TO AVOID MISUNDERSTANDINGS. WHY NOT CHECK OUT MY OTHER ITEMS AND ALSO MY FEEDBACK FOR YOUR REASSURANCE. HAPPY BUYING. Nouvelle annonceRemplacement de lampes Micro-Lampes 2,8x4mm - rouge - 10 Pièces "Neuf"
Kleinst-Steck-Lämpchen 19V. 35mA, Sockel 2,8x4mm,ROT. Die Lampen sind NEU! finden Sie eine große Auswahl von weiteren Zubehör, Gleisen, Weichen, Waggons usw. auch zum Sofort-Kaufen. HRT128 jouef/hornby ho 1x eurostar power/dummy car bodyshell c/w pantos, glazed. HIS OFFER IS A HORNBY HO EUROSTAR (DUMMY OR) DRIVE CAR BODYSHELL C/W GLAZING AND HEADLIGHTS. ALSO INCLUDED ARE THE TWO PANTOGRAPH ASSEMBLIES AND THE END PANEL. RN3211. IN NEAR EXCELLENT CONDITION. FOR MORE BARGAINS PLEASE CHECK OUT MY SHOP AT TONYSSTOREONLINE. OVERSEAS BUYERS ARE WELCOME BUT PLEASE CHECK OUT THE PAYMENT AND POSTAL ARRANGEMENTS. THANKS FOR READING THE SMALL PRINT BELOW - IT'S THERE FOR YOUR PROTECTION - AND MINE, AND TO AVOID MISUNDERSTANDINGS. WHY NOT CHECK OUT MY OTHER ITEMS AND ALSO MY FEEDBACK FOR YOUR REASSURANCE. HAPPY BUYING. Hornby X8872 0-6-0 Wheel set with blackened rims (black). Used model railways & collections always wanted. With Traction tyres. Will fit early or late steam or diesel loco chassis with sprung rear axle. Locomotive coupling rods for 4 coupled locomotive of 9'0" wheelbase. Chrom 22.2x300mm. Chrom 22.2x300mm. Important: nous ne livrons pas dans les îles, colonies et les autres terroirs au-delà. Nous ne pouvons pas fournir d'assistance technique spécialisée. It has the front buffers ,whistles - all the handrails and the bright steel reverser. Very good. 8042 8F numbering - good all round example. This body fits the ringfield motor version. Beide fahren gut, ab Werk ohne Licht. Monatlich werden ca. 1000 Lose neu gelistet. Eine günstige Lok für den Spielbahner, ein Vitrinen-Modell im Original-Karton für den Sammler, Bastlerware für den Schrauber, oder ein Reste-Konvolut für den Landschaftsbauer?. Die Lampen sind NEU! Glühbirne raus - LED rein - fertig! Sehr hohe Lebensdauer. finden Sie eine große Auswahl von weiteren Zubehör, Gleisen, Weichen, Waggons usw. auch zum Sofort-Kaufen. LED -Birnchen E5.5 Schraubgeinde, 16-22V, warmweiß. Remplacement de lampes Micro-Lampes 2,8x4mm - clair - 10 Pièces "Neuf"
Kleinst-Steck-Lämpchen 19V. 35mA, Sockel 2,8x4mm, klar. Die Lampen sind NEU! finden Sie eine große Auswahl von weiteren Zubehör, Gleisen, Weichen, Waggons usw. auch zum Sofort-Kaufen. IF IN DOUBT ALLWAYS REQUEST INVOICE. Twelve in good used condition, may have a little surface rust, plus two as new, still on original card. Used model railways & collections always wanted. Part listed on Hornby Service Sheet no. 325b. HS1-9, IV41-53, 55-56, KA27-28, KW15-17, PA20, 41-49, 60-78, PH42-44, ZE1-3 (48-120 Hours subject to ferry schedules and weather) Up to 20 kilos £25.99. Hornby X9854 Ex Lima Class 20 Universal Joint & Worm Drive Gear Plus Bearing. Used model railways & collections always wanted. Part Listed On Hornby Service Sheet No. 335. (This item will fit earlyier Lima models). Two Triang mk1 restaurant coach units in very good condition. I will provide a postage discount if purchased with other Triang items that I have for sale on eBay. FOR MORE BARGAINS PLEASE CHECK OUT MY SHOP OFFERED IS A PAIR OF SHOULDER TYPE MOTOR BRUSHES AND SPRINGS TO FIT LIMA OO/HO STEAM AND DIESEL LOCOMOTIVE MOTORS. GENUINE NEW LIMA PART No 600875. PLEASE NOTE THAT I HAVE LISTED ALL NEW LIMA SPARES I HOLD AND THAT I AM UNABLE TO SUPPLY LIMA SPARES OTHER THAN THOSE LISTED. PLEASE STUDY THE PICS CAREFULLY TO ENSURE THAT THIS ITEM IS WHAT YOU REQUIRE. HARD TO FIND SO STOCK UP WHILE YOU CAN. FREEPOST TO UK. OVERSEAS AT COST. GRAB IT NOW BEFORE SOMEBODY ELSE DOES!!! OVERSEAS BUYERS ARE ALWAYS WELCOME - PLEASE CHECK THE PAYMENT AND POSTAL ARRANGEMENTS THANKS FOR READING THE SMALL PRINT BELOW - IT'S THERE FOR YOUR PROTECTION - AND MINE, AND TO AVOID MISUNDERSTANDINGS. WHY NOT CHECK OUT MY OTHER ITEMS AND ALSO MY FEEDBACK FOR YOUR REASSURANCE. HAPPY BUYING. Triang Railways OO/HO R115 Transcontinental Caboose. The item has the older pre-1960 open couplings. Glühlampe hell, 19 Volt, 70mA. (Märklin 600080). Die Lampen sind NEU! finden Sie eine große Auswahl von weiteren Zubehör, Gleisen, Weichen, Waggons usw. auch zum Sofort-Kaufen. Monatlich werden ca. 1000 Lose neu gelistet. Eine günstige Lok für den Spielbahner, ein Vitrinen-Modell im Original-Karton für den Sammler, Bastlerware für den Schrauber, oder ein Reste-Konvolut für den Landschaftsbauer?. Used model railways & collections always wanted. These units are for the Early Motor Bogie motors as found in the Blue Pullman, DMU, Transcontinental (both Single & Double ended diesels), Dock Shunter & E3001 Electric model locos. OFFERT EST UN MOTEUR COMPLET X9362M AVEC SUPPORT EN FONCTION DE LA CLASSE 08 LOCO R2438/R2777/R2589/R2591/R2871. HSS 278e. Used model railways & collections always wanted. 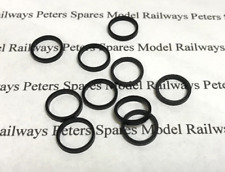 Peters Spares Model Railways Ltd. HS1-9, IV41-53, 55-56, KA27-28, KW15-17, PA20, 41-49, 60-78, PH42-44, ZE1-3 (48-120 Hours subject to ferry schedules and weather) Up to 20 kilos £25.99. Running No: 35028. Used model railways & collections always wanted. (a) send them back, or (b) hand them over to the trader or to a person authorised by the trader to receive them. How it started; I have been interested in model trains since I was a child. W2227 CITY OF STOKE-ON-TRENT FULL SET OF DECALS. R/NO 6254. YEAR 1970. FULL FITTING INSTRUCTIONS WILL BE INCLUDED. TRACTION TYRES - DIESELS AND TENDER-DRIVE STEAM LOCOS (8 OFF) ..
Lima locos would manage without them. The Hornby Dublo/Wrenn 8F Castle Scot l ocomotive offset type bar and screws in used condition or spares repairs will fit Wrenn Wrenn/Triang 8F and Scot.